The July/August issue of Relevant magazine had an article with "10 Things to Do in the Summer of ’05." The idea is to take pictures of yourself doing all 10 with the magazine and send em in. You then get a free Relevant T shirt and, better yet, you’re entered into the chance to win a Sony PSP. There was some fun stuff on there so I said, "Hey hon," (to Rachel of course), "let’s see if we can do em all!" 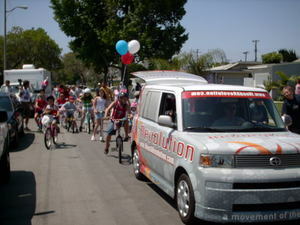 We already had some of the events planned, so we started today with a parade for the fourth in the Platt neighborhood! 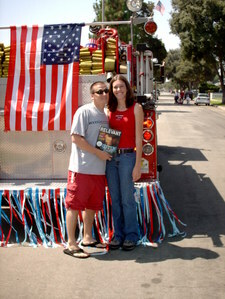 Every year since 1985, Jenny’s parents, Bob and Sara Matulich, have a community parade in their tract in Long Beach. All the kids decorate their bikes and the fire truck even comes to lead the parade. So we joined in the festivities with the Revolution Scion. We kicked open the back and blasted patriotic music throughout the neighborhood while we cruised. I think my ears are still ringing! It was such a cool morning! I’m kinda sappy like that (and I’m really patriotic), but it was just so cool to see so many people together in community for the holiday. There must have been 100 people there in the parade and then hangin in front of the Matulich home eating and celebrating afterward. It was such a fun morning! This afternoon we’ll be heading out to a barbeque, and then hopefully catching some fireworks tonight. I hope everyone’s having a great fourth! As we check off more of our summer activities, I’ll be sure to throw em up here just for fun! Just an interesting video online here. I’ll refrain from any comments and let you form your own opinion. It’s that time again. Around rolls another year of VBS and it’s time for Bobby and Dave to get dressed up and entertain the kiddies! Doesn’t every worship leader/pastor team do this? So this year the theme is Summer Safari and that makes me Safari Sam, animal photographer out to get some good shots. And yes, that is Dave in a pink gorilla suit to lure animals out to get their pictures (he took off the head at this point). It takes a real man to wear pink. We had a blast singing some Summer Safari songs with them as well as Peace Like A River and, of course, the infamous Banana Song. It was a great morning with almost 100 kids showing up and there’s sure to be more who will sign up tomorrow. Check out more pictures from the first day of Summer Safari! I spent Wed. – Fri. down at Newport Dunes for Soul Survivor’s worship conference – Momentum. They ended up making it a free event, so Rachel and I took advantage of the opportunity and spent the three days camping on the beach down there. Throughout the three days there were times of worship led by Tim Hughes, Rita Springer, and David Ruiz and some teaching by Mike Pilavachi (one of my personal favorites) and several others. Unfortunately I didn’t have wireless access to blog as I was there, so i’ll throw up some of my notes and thoughts in retrospect right now. Overall, it was a great time. As I said, Rachel came with me and one member of our team, Michelle, was there as well. I hope in the future to see more team members at stuff like this because the encouragement and the learnings are just great. The best part of the weekend was definately the worship itself. Tim Hughes especially is an amazing leader, and there is nothing like worshipping with hundreds of people who are really passionate about worship. The main sessions were ok – depending on who was sharing – and there were some useful lab intensives. Here’s a couple of highlights and learnings from the trip. To be honest, the opening session didn’t excite me too much, so I was a bit concerned about how the week would be, but the rest of the day went great! We started at a session called "Missional Hospitality" led by Greg Russinger from The Bridge Community. He is the pastor of a very artistic community of faith in Ventura. This lab was very interactive and creative and had some great stuff in it. He began by seeking to work on being hospitable before we could get to the missional part. 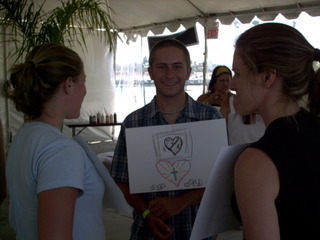 He gave each of us a piece of paper and had us create a picture representing the current state of our heart. From there we had to walk around the tent and get to know each other by our condition. This was a way to encourage us to be real with each other. Here are some of his other key points that I enjoyed. Your Churches should be made up of naked people – We need to be a community of people open and honest with each other. Those who live in their condition always bring us to the throne room of God. Your conditions will lead one another to Christ. We need to truly see people – when you look at others do you really see them through Chrsits eyes and see their humanity. The Gospel is centered in the humanity of real people at real times with real emotions. Just as Christ took the blind man out of his familiar area to heal him, so Christ will often take us outside of our familiarity in order to see more clearly and better "see" people. Wed. evenings main session was particularly moving and powerful for me. Tim Hughes led worship and Mike Pilavachi spoke on the topic of walking by faith. Mark 2 – The Paralytic. Christ knew the men’s faith by the whole in the ceiling. Faith is a doing work – it is lived out through actions. Romans 10:17 – When we’re in the world more than the word, we begin believing the world rather than the word. If we want God to speak to us, we need to listen and be ready to obey no matter what he may ask. The night was filled with some amazing worship time, and Mike allowed for some serious time of ministry and invitation to the Holy Spirit. I must say, I have had some great encounters with God and with the Spirit, but i experienced the Holy Spirit on Wednesday night in a way that i never have before. I felt so immersed and so overtaken and I know it is something that will effect my worship life forever. This session with Hughes and Pilavachi was specifically aimed at leading times of ministry in the power of the Holy Spirit. They began by sharing some great insight and thoughts on the topic and then opened it up to questions. It was great to hear answers to practical questions from how to lead a band in a way to allow space for God to work to working together as a pastor and worship leader. Here were some key points that were made. Make space and WAIT – invite God’s presence in, and then wait for Him to lead. In waiting, when it get’s really really uncomfortable, sometimes you need to wait a little longer. Don’t be afraid of allowing people to cry. If you can’t bleed in a hospital, then where can you bleed; and if you can’t cry in a church, where can you cry. Pastors and leaders – sometimes if you want to allow these times, you have to stop being such a control freak. The only way to get it right is to give yourself and others permission to get it wrong. As I said, Tim also shared some great tips on the leading of the band as well. To be honest, the best thing I took out of this was feeling really good about my relationship with Dave and how we work together in ministry. I am so blessed to do this stuff with a friend and a pastor who who is flexible, supportive, and encouraging. So many others are on different pages with their lead pastors, and its great to know that Dave and I are together in this thing. Thursday night after the main session we spent time at acoustic worship with Tim Hughes. More great worship. Enough said. Afterwards, we spent some time at a venue called "Cafe Theology" where we hung out for a late night discussion around tables with Paul Martin and Todd Hunter. The topics ranged from effective friendship evangelism to postmadern ministry to the churches current emphasis on musical worship and whether it was healthy or unhealthy. It is always interesting to hear the questions that people have and to hear other peoples thoughts and opinions. Engaging Culture – What is "culture?" What do we mean by "engage?" Defining "Christian Artist" – How does one reconcile being an artist and a Christian? 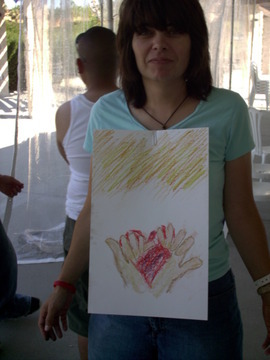 Is art a viable ministry worthy of support? Artists purpose – Is an artis’s responsibility to provoke and challenge or edify the body? Or both? This session tended to be mostly question and answer and theoretical discussion. 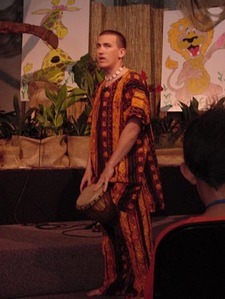 It was pretty clear that most "artists" in the church today tend to march to the beat of a different drummer. A lot of artists tend to come up against opposition in the local church unless their art contains Christian icons and is always uplifting. The most useful part of this workshop was toward the end with a short discussion on how art can be encouraged and used in the context of the local church. The week ended with a night of worship with Tim Hughes and Mike Pilavachi. 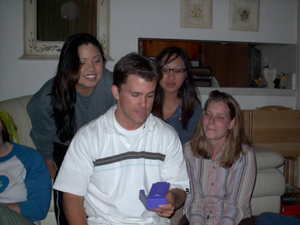 Jon and Jenn Gaw joined the three of us that night for a few hours of praise and worship. Mike spoke this time on falling in love with Jesus and especially with the word of God. It was a great end for the event. I definately came away from the three days with some things to think about. But most of all the time of worship throughout the three days with three seasoned worship leaders was refreshing and a blessing. I came away feeling great about where I’m at and where we are at as a community. I recognize that I still have a lot to lear on this journey and I’m in a great place to do it. After interviewing hundreds of psalmists, I can safely say that worship leaders are a special breed. They nurture the souls of sensitive singers, and encourage brusque sound guys to be…less blunt. They see the gifted drummer within a goofy 9-year-old. Worship leaders sharpen their mastery of Scripture and musical chops in the same week. They calmly walk into meetings where they’ll receive near-lethal doses of personal criticism. Through it all – praise God – these worship leaders will somehow emerge with tender, Davidic hearts. I suspect it’s all part of God’s greater strategy in conforming us to the image of Christ; pressure turns coal into diamonds, and the constant rub of a grain of sand creates a pearl. The unique pressures of a psalmist create a unique kind of perspective and character. Such “Worship Team Wisdom” probably contains the essence of what we need to know about life; it worked pretty well for King David. Over the years, I’ve repeatedly found myself drawing on principles learned while working with worship teams; I’ll share here my personal top ten bits of Worship Team Wisdom. God often turns our worst mornings into miracles. There are Sundays I step down from the platform thinking I should resign and get a job at Walmart. These are usually the same days someone grabs my hand, and – tearfully – thanks me for leading them into the Presence of God. I don’t know how God transforms my clumsy moments into masterpieces, but I’ve seen Him do it over and over, and not just with music. Trusting that His transforming power is working in us (and often in spite of us) should keep us both humble and confident (Ph. 2:13). As I read through this article, there were some great reminders and some things that I think all of us have learned even in the past few months as our community serves God together. Many of us at Revolution, whether leading the worship, playing an instrument, singing in the choir, or running the sound board, are lead worshippers and can relate to the experiences noted here. This is a geat journey that we are on, and I look forward to many more learnings as it continues. I got a new site to host my blog! I wanted to make it a little easier for people to be able to find my blog, so with Chris Koble and geekhost as my web hoster (shamless plug: if you need a site go to him!) I finally got it all set up. Obviously it is still available at the old address for those of you who may have bookmarked it already, but for the rest of you it should hopefully be easier to find and share with others. In the near future I hope to add some extra pages with some past videos and stuff, too. This morning 11 of us met at Starbucks in Seal Beach for the surfing connecting event. 10 guys and one lone lady! We had a good morning of hanging out and catching some waves together. It’s been a while since i’ve been out, so I definitely need to make more time this summer to surf, even if that means early mornings which I hate. If you enjoy surfing and you wanna join in the fun sometime, shoot an e mail over to Tim Lasch so he can let you know when it happens again. The group usually goes out on the third Saturday of the month and meets at 8ish at Starbucks in Seal Beach. And now it’s time to do some studying for my most recent class, Research Methods fro the Study and Teaching of Scripture. I can tell this will be my most challenging class in the program (Vanguard SPS) yet as far as workload as well as just my own understanding of different Bible passages and methods of interpretation. Then this evening the India team meets to have dinner with Suresh Kumar from Harvest India. I am really looking forward to that. Dave shared with me some more info he has learned about our plans for India this August and I am pumped about going. I’ll be sure to share more as the details come. 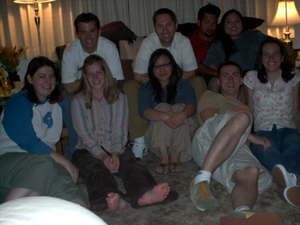 Last night our life group got together for a fun evening at the home of Bill and Jennifer Gibb. 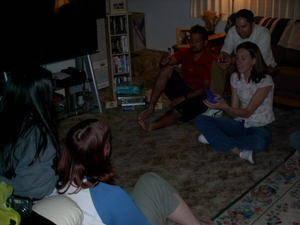 It was a game night and our first social event as a life group. We had a blast! Lots of games and snacks. I’ve found that game nights tend to be an excuse to be competitve and get fat! It was great hangin with our life group. Rachel and I feel so connected to our group and it’s been great to get to know new people and continue to see new people joining us. Anyone who wants to join us, we meet in downtown Long Beach at Pacific and 7th every Tuesday night at 7pm. Email me for more info! If you’re not currently in a Revolution life group, come get plugged in! Three Trees Theater, a production company based out of ROCKharbor has a musical coming up that looks like it should be pretty cool. It’s called Songs for a New World and it’s a musical about four individuals living in New york City on the day of 9/11. I’ve heard the recording of the music from an original production of this show and it was really good. I look forward to checking it out some weekend between July 8th and July 23rd. Check out this flyer to get more info.